From the Vivaldi Magnificat, this edition is a perfect selection to introduce your treble chorus to Baroque style! An excellent choice for festival and competition. In Latin. Available: Unison Treble. Duration: ca. 2:00. Here is the second movement from JS Bach's beautiful Magnificat. This music soars and lies beautifully in the voice. With only eight Latin words making up the text, rehearsal time can be dedicated to vowel uniformity, breath, phrasing and discovering Baroque style. The Jumblies, by the 19th century writer, Edward Lear, is a tale full of fantasy and humor, in which the adventurous, endearing, and colorful Jumblies decide to set sail over rough seas in a sieve, a kitchen utensil used as a strainer. Younger choirs will enjoy the fanciful verse as they recount the Jumblies' foolish and dangerous journey! This imaginative setting of the Robert Lewis Stevenson poem evokes the sights and sounds of the moon at night, shining on all the creatures at night. Ideal for developing expression with young choirs. Performance Time: Approx. 1:30. This beautiful folk song lament from northern England is given a creative treatment in this new arrangement. Set in the uneven meter of 5/8 and with an accompaniment that can be realized by piano, guitar or harp, this is a teaching piece for your choir. The counter melody can be sung or played by a C instrument like a flute or oboe. The sturdy melody of a favorite Sacred Harp tune is first presented in unison by the choir, decorated by a flute obbligato. Verse 3 is sung by a soloist, while in verse 4 the choir returns with the melody and a descant for a jubilant finish. 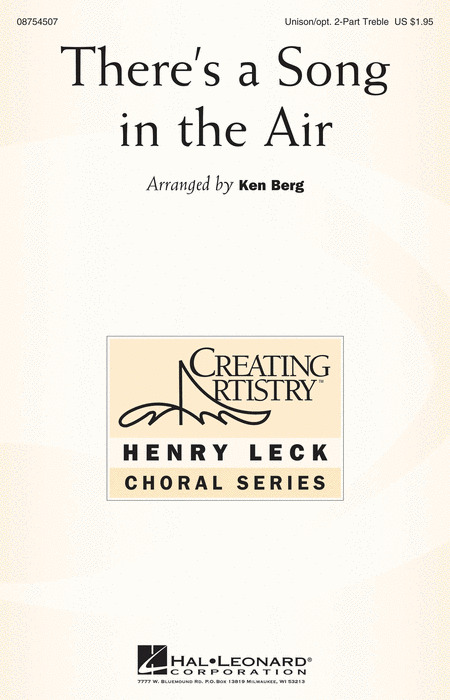 Ideal for Christmas concerts or festival performances by children's choirs and middle school. This imaginative set of two poems by Robert Louis Stevenson are ideal for developing expression and vocal tone with young choirs. The first, Bed in Summer, is in a stately waltz tempo with a serene lyricism. The second, the popular Where Go the Boats, is in a playful 3/4. Drawing from Latin, European and Indian roots, this concert piece allows the singers to share in the hope and dreams of children all over the world. Available: SSA(B), Unison. Approx. Time: 3:30.